Whatever kind of runner you are, one thing that is sure to be of benefit is receiving some expert advice. Thanks to the team at ASICS you can now do this in the form of Running Clinics that are being rolled out across the country to help you get the most out of your running. Offering total running support the clinics will give you the chance to have your gait analysed to ensure you are wearing the correct footwear, be given dietary advice to help with pre and post run fuelling, there will be tips on training and race days, any niggles or injuries can be discussed and you can keep up to date with the latest ASICS kit too. 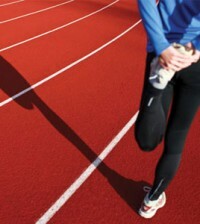 Just visit www.asics.co.uk/running_clinics to find out where your nearest Running Clinic is being held. They are free to attend, you just need to sign up on site to register your interest. In order to deliver the best advice and guidance, ASICS has enlisted the help of professional consultants to offer independent advice in their field of expertise – the PRO Team. If you get a stitch while you’re out running should you try and run through it? That’s a really hard one to answer because no one can say what causes the stitch. Some people press on the area where you have the stitch, others believe there’s nothing you can do, other choose to run slowly till it passes, or you can stop and stretch. Basically you will have to test these all out and find the best remedy for yourself as everyone is different when it comes to stitches. If you’re looking for an instant energy boost are there any particular foods you can recommend? My top tip is not to wait until the stage where you are hungry and needing a quick fix. If you wait until you need an energy boost then you’re more likely to want some chocolate, or caffeine, so it’s better to plan your day so you never get to that stage. If you know you’re going to be hungry at 11, eat at 10.30. The best instant snack is a banana. What is the best advice you were ever given in terms of running? I think you just have to do what’s best for your body, you can read opinions in magazines and I think it’s good that you take these opinions on board but you need to learn what’s best for your body. Is there anything you can do about shin splints? Yes there are lots of different causes which include old trainers and poor biomechanics so if your trainers are shot and your mechanics are wrong then you are going to overload the muscles on the inside of the leg. The actual term shin splints actually means pain on the medial aspect of the shin. This could be a fracture on the actual bone in which case you will have to rest or it could be soft tissue damage in which case you may get away with easing it out and icing the area. It is one of the most common problems I see with runners. 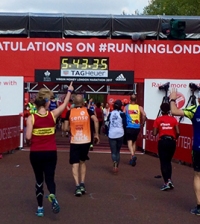 What advice would you give budding runners? Start off slowly and get yourself an exercise buddy and make sure you get some good music, preferably something nice and upbeat. How important is foot care for runners? It’s incredibly important, not just the superficial foot care to make sure you don’t have hard skin or ingrown toenails but also the structural health, which can really affect you, even causing problems in the lower back.